Two persons, including a clerk of the local office of the district transport officer (DTO), have been arrested in connection with an alleged racket of issuance of fake registration papers of vehicles from here. Naveen, an 18-year-old youth of Sisana village located on the Rohtak-Sonepat road, was stabbed to death in broad daylight at a cinema hall here today. According to SSP Hanif Qureshi, the incident took place when a new film was being screened at the Liberty theatre. Panthers have created terror in Kalesar-Faizpur village of Chhachhorouli block here. A panther entered a house in the village and killed three dogs last night. Following the arrest and interrogation of all seven accused in Lara murder case, the police claims to have linked the events leading to the murder of Gohana Balmiki youth Rakesh, alias Lara, on August 27. Haryana has signed a Memorandum of Understanding (MoU) with the US-based Montgomery College to get assistance of Montgomery College for Haryana in adopting the best practices of the college. Two councillors of the Municipal Corporation of Faridabad (MCF) and their supporters clashed today following which the matter reached the police. In two cases of narcotic trafficking, two local courts convicted three persons and sentenced them to imprisonment of different terms. One of the biggest vegetable and fruit markets of Asia is proposed to be set up in Haryana on the model of the Rungis Fruits and Vegetables Market of Paris. The proposed market would come up in an area of about 400 acres at Ganaur in Sonepat district. The Congress is gearing up to face a possible mid-term general election. The Haryana Pradesh Congress Committee has issued instructions that ministers heading district public relations and grievances committee will chair meetings of their respective district Congress committee (DCC). The development of the western dedicated freight corridor project and the Delhi Mumbai industrial corridor has been approved in principle by the Central government according to Haryana chief secretary Promilla Issar. Two persons were killed in separate road accidents in the district in the past 24 hours. In a head-on collision between two vehicles on the Rewari-Kanina road, 20 km from here, Dharam Vir Yadav (32), resident of Masset village, near Siha, died on the spot. A youth was killed on the Ambala-Chandigarh road when the official car of the vice-chancellor of Kurukshetra University reportedly hit his motorbike. Mystery shrouds the recovery of a woman's body from the Panjokhra area today. The woman had gone missing from her home in Boh village two years back. Twentyeight-year-old Kamaljeet's body was recovered from a vacant area close to the Panjokhra road. 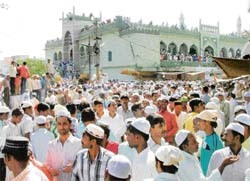 A compromise has been worked out by a maha panchayat in the gotra row involving a young couple of Nauhani village in Mullana.The couple has been advised to return to the village only after a few weeks. Several documents, including a stamp of the DTO, blank affidavit papers bearing the stamp of a notary in Delhi, some registration numbers and RCs of about 15 vehicles have been seized from their possession. A case under Sections 379, 420, 467, 468 and 471 of the IPC has been registered against them. According to a spokesperson for the district police, the CIA wing got information about the racket and conducted a raid. The duo was present on the premises of the mini-secretariat here last evening along with papers and documents and a Santro car. They reportedly used to carry out the work of preparing fake documents of registration while being mobile. The police seized registration papers of 15 vehicles, besides six blank affidavits attested by a notary of Delhi, a register of the DTO office, a stamp and Rs 40,000 from them. The accused have been identified as Rajesh, a clerk and resident of Ramgarh village, and Ram Niwas, reportedly working as an agent in the office. A senior officer had been suspended after being booked by the police in connection with a similar scam in the district on August 24 this year. The official was posted as the SDM at Narwana, a subdivisional town in the district, when a raid was conducted by the Vigilance cell of the office of the Chief Minister. It was revealed that as many as 288 vehicles had been registered here in a fraudulent manner. Six persons, including the SDM and two employees, had been booked in this regard. The police is now investigating if the arrested persons here had any connection with the earlier ones. Some youths reportedly called Naveen out while the film show was on. An altercation took place between them outside the theatre near the parking lot. The verbal duel soon took the shape of a scuffle, in which Naveen was stabbed with a pointed weapon. The assaulters fled form the scene soon after, while some bystanders took Naveen to the PGI hospital, where he was declared brought dead. The police has registered a case on the basis of a complaint lodged by the family members of the deceased. Three youths, Sandeep, Sudhir and Lalit, have been named as suspects in the case and efforts are on to trace them. Of the suspects, two belong to Aasan village. No arrests had been made till the time of filing this report. During the past three months, panthers have killed two cows and several dogs. Sources said a panther entered the house of Shyam (nambardar of the village) and first attacked a dog which was tied. Then it attacked two more dogs. Vineet, son of Shyam, saw the panther and raised the alarm. The panther disappeared into the jungle. The animal also tried to attack the cattle tied in the house. Villagers said about three months ago, a panther had entered a Harijan colony in the village and killed a calf. It had also attacked a cow, which died after a few days. The village is located in the jungles and has a population of more than 5,000. Officials of the wildlife department reached the village and inspected pugmarks of the panther. It was yet to be ascertained if only one panther was attacking domestic animals or more. Satpal Dhiman, a wildlife official, said there were 12-15 panthers in the Kalesar jungles. The wildlife department gives a compensation of Rs 300 if a wild animal kills a goat and Rs 800 for a cow. The accused are Prahlad of Chhudani, Dinesh, alias Dinu, of Khanda, Ashok of Birdhana, Dinesh of Murlana, Naresh, alias Neshi, of Busana, Sanjay of Butana and Ram Niwas also of Murlana. According to senior superintendent of police Navdeep Singh Virk, Prahlad, who was undergoing life imprisonment in Karnal jail in a case of murder of his uncle on May 12, 2000, developed friendship with Sanjay of Butana, an accused in a number of murder cases, and also came in contact with Neshi in Karnal jail and Dinu in Rohtak jail. In Karnal jail, Sanjay had asked him to eliminate Lara. After his release on parole for 28 days in April last year, Prahlad did not return to the jail and committed a number of crimes. During one of his “mulakat” with Sanjay in Karnal jail, Sanjay informed him that Dinu had also been released on parole and he should meet him. On August 25, Prahlad, Ashok and Dinu assembled at Bhindawas and decided to ask Neshi to join them. Prahlad and Ashok were provided arms by Dinu and they were sent to Gohana in an Esteem of Ajay of Hansi. Neshi joined them at Gohana. On August 27, Prahlad, Neshi and Ashok met at the residence of Raju on the Baroda road and started searching for Lara. Lara was seen sitting outside Khasa School and was shot dead. As per the MoU, this would be done through the provision of professional development, curriculum sharing, strategic planning, budgeting, institutional advancement, faculty and students’ exchange and articulation with the universities of Haryana, an official statement said here today. The MoU had been initiated as a response by Montgomery College to a request from the Haryana government for assistance in workforce creation and development, which is the cornerstone of the partnership that would also be extended to undergraduate and graduate studies with a particular focus on the industries prevalent in Haryana. Minister for local bodies A.C. Chaudhary has also been dragged into the controversy. Incidentally, Chaudhary also represents NIT assembly constituency in the district. District police chief Alok Mittal said complaints had come from both sides and the DSP, NIT, had been deputed to investigate the matter. Pratap Chawla, councillor from ward 5-C (NIT), and Naresh Gosai, a co-opted member of the MCF, along with their supporters, clashed on the issue of supervision of work relating to strengthening of a road. While Chawla claimed that it was his right as he was the duly elected councillor of the ward, Gosai’s view was that he was a Congressman and Chaudhary had directed that only he would supervise the work. The incident happened immediately after Chaudhary left the site after he ensured that construction material and officials reached the site to start the work. Chaudhary is said to have left for Kurukshetra. election of the MCF. However, Chaudhary, being the MLA of the area, was instrumental in getting him co-opted in the civic body. Chawla complained to the police that Gosai and his supporters assaulted him. Gosai has also lodged a counter complaint with the police. While Chawla could not be contacted, Gosai rebutted his charges. He said Chawla and his supporters came to the spot with arms and tried to disturb the progress of the work on the road. Another accused was acquitted by the court for want of sufficient evidence. Additional District and Sessions Judge J.S. Dahiya yesterday sentenced Sukhdev, a resident of Mohamadpur Rohi, and Sham Lal, a resident of Munshi Wali, to 15 years’ rigorous imprisonment and imposed a fine of Rs 2 lakh each for trafficking of poppy husk. They will have to further undergo a jail term of one year each in case of their failure to pay the fine. The local police had arrested them for carrying 88 bags of the contraband in a truck near the local Matana road on March 10, 2003. Later, the police had also arrested Dharam Pal, owner of the truck, in this connection. The judge convicted Sukhdev and Sham Lal and pronounced sentence on them today, while Dharam Pal was acquitted by the court as the police had failed to produce sufficient evidence against him. In another case, Additional District and Sessions Judge N.P. Dewatt yesterday sentenced a person to 10 years’ rigorous imprisonment and imposed a fine of Rs 1 lakh for trafficking poppy husk. The convict, Kaka Singh, was arrested by the police on June 14, 2005, along with two bags of poppy husk near Rozanwali village in the district. A draft of the proposal was discussed by a visiting French team of experts with Haryana agriculture minister Harmohinder Singh Chatha and the proposal has been accepted in principle. The HPCC is worried as the DCCs are reportedly not discharging their duties properly. It has been observed that the DCCs have failed to hold regular meetings of party workers. “And even when meetings are held, the participants are generally office-bearers only,” said a senior Congress leader. 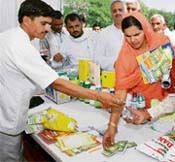 Kartar Devi, health minister of Haryana, while addressing party workers here yesterday, said from now on, ministers who had been appointed chairmen of the grievances committees would hold meetings of the DCCs immediately after chairing the meeting of the committee every month.Kartar Devi was here to chair a meeting of the district grievances committee. A Congress leader said on condition of anonymity that the DCCs would lose their status and their presidents and other office-bearers would not be able exercise their control on the district set-up once ministers started heading district workers’ meetings. The move to appoint ministers to chair meetings of DCCs assumes significance in the wake of the growing popularity of Bhajan Lal and Kuldeep Bishnoi. This 1,400-km long corridor would cover 92 km of area in Haryana. The corridor would cover 60 per cent of the area falling in the National Capital Region of Haryana. She said this while interacting with mediapersons here yesterday further stating that the corridor would pass through seven states, including Uttar Pradesh, Madhya Pradesh, Maharashtra, Gujarat, Rajasthan, Haryana and Delhi. Two persons were killed in separate road accidents in the district in the past 24 hours. In a head-on collision between two vehicles on the Rewari-Kanina road, 20 km from here, Dharam Vir Yadav (32), resident of Masset village, near Siha, died on the spot. The mishap occurred when the jeep, in which the deceased was travelling, was going to Rewari while the other vehicle was coming from the opposite direction. The Khol police has registered a case under Sections 279 and 304-A of the IPC against the driver, who reportedly absconded soon after the accident. In another incident, an unidentified person was reportedly crushed to death by an unknown vehicle yesterday on the Delhi-Jaipur highway near the Banipur Chowk, 10 km from here. The Kasaula police has booked the driver of the vehicle. Maninder Singh (21), who was on the pillion, sustained injuries and was admitted to the local civil hospital. The deceased was identified as Parbhjot Singh (22). The uncle of the deceased, Jasdeep Bedi, said the VC should have come to the hospital to console the parents of the deceased. Mystery shrouds the recovery of a woman's body from the Panjokhra area today. The woman had gone missing from her home in Boh village two years back. 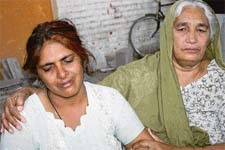 Twentyeight-year-old Kamaljeet's body was recovered from a vacant area close to the Panjokhra road. The body was noticed by a passer-by who raised alarm. A police official said the body had putrefied and the exact cause of death would be known only after the postmortem was carried out. Kamaljeet was a widow who had gone missing from her home in Boh two years back. The matter had been reported to the police. Tilak and Anita, who belong to the Dalit community, had married within the same gotra for which thy had been asked to leave the village. Today, a maha panchayat was held in which members from different villages debated the issue. Panchayat members from Nahauni, Tamnoli, Hamidpur, Ghola Mullana, Saha and Gholi villages were present. Family members of the couple also expressed their opinion over the matter. The girl’s maternal uncle said the marriage was not acceptable and violated social norms. However, it was pointed out in the maha panchayat that the girl had been brought to Nauhani village after her mother had died. Since the girl’s mother had been married in a different gotra, this was no longer a case of same gotra. Deputy commissioner, Mohammad Shayin said a compromise has been worked. “the matter will not be raised again.District administration officials were present at the meeting,” he said. He said there was no ban on the entry of the young couple into Nauhani village. “Their family members have advised them to stay away for a few weeks. The police protection will be provided to the couple,” he added.